The first elimination race of the 2018 Monster Energy NASCAR Cup Series Playoffs is set for Sunday, September 30 (2 p.m. 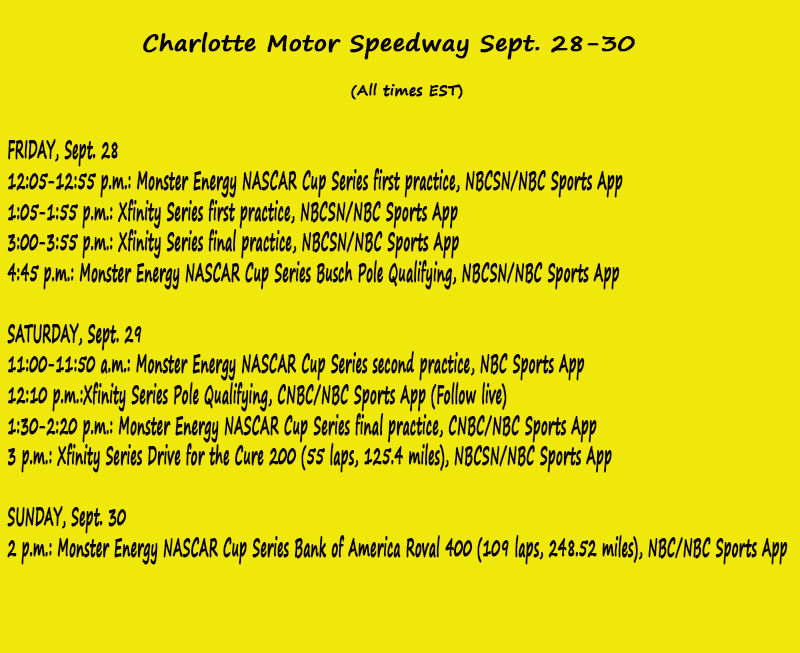 ET on NBC, PRN and SiriusXM NASCAR Radio) at the Charlotte Motor Speedway Road Course, the first road course the sport has ever included in its championship Playoffs. There are many unknowns with so much on the line – from the track to the championship implications as four of the sport’s most accomplished and popular drivers sit on the verge of elimination, most likely needing a victory or a top-five finish to continue their Playoff run. High drama and intrigue are expected in the Bank of America Roval 400. And the prevailing competitive philosophy for so many of the drivers seems to be that a positive attitude toward this unknown ROVAL circuit will go a long way. Two-time winner this season, Clint Bowyer, seven-time Monster Energy Series champion Jimmie Johnson, this summer’s Daytona winner Erik Jones and perennial Playoff contender Denny Hamlin are the four drivers hoping to avoid elimination. Ryan Blaney sits only four points ahead of Bowyer in the 12th and final Playoff transfer position. Alex Bowman has only a five-point edge on elimination and Chase Elliott and Austin Dillon are tied, only 10 points to the good. “At this point in the season, we need a win, and that’s how we can continue to chase down a Championship,” said Hamlin, driver of the No. 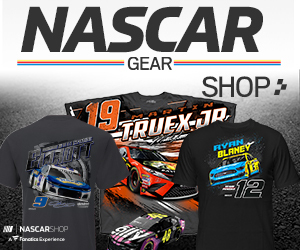 11 Joe Gibbs Racing Toyota who is ranked 16th – 29-points behind 12th place Blaney. 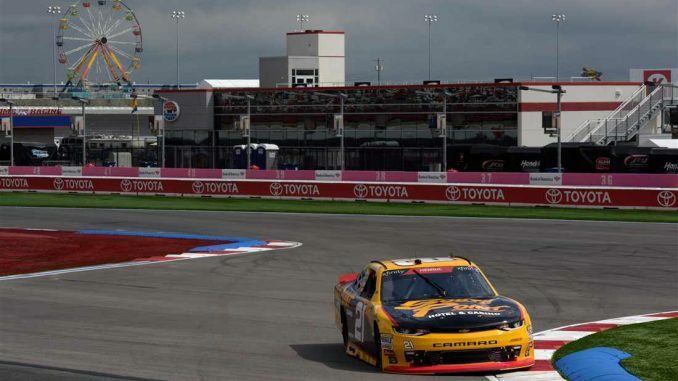 The 17-turn, 2.28-mile course that NASCAR breaks in this week makes use of a new infield road course as well as the high-banked Charlotte Motor Speedway. And only Playoff winners Brad Keselowski (Las Vegas), Kyle Busch (Richmond, Va.) and Martin Truex Jr. have already secured their spot in the next round with either a win or enough points to guarantee their position. Kevin Harvick, a seven-time winner this season, needs only to start at Charlotte to join them. Fifth and sixth place Joey Logano and Aric Almirola have 25 and 23-point cushions, respectively in the Playoff points. Seventh place Kyle Larson holds a 17-point edge to the good and eighth place Kurt Busch is 15-points ahead of the cutoff line. There are plenty of opinions about having such a unique new track at such a crucial time in the Playoff portion of the schedule. Fans are excited and the drivers are motivated. “The ‘ROVAL’ is such an unknown,” said Johnson, the driver of the No. 48 Hendrick Motorsports Chevrolet who sits six points behind 12th place Blaney. “All I have to go on is our test session and we actually had a really good test in July, so maybe there’s a chance for us to get a win. It’s going to be exciting for the fans and could switch up the Playoff picture for sure. Christopher Bell’s victory in the Richmond, Raceway Playoff opener last weekend puts him on a good track to become the third Sunoco rookie champion in the last five seasons (William Byron, 2017, Chase Elliott, 2014). It marked his fifth win of the season – tying him for most wins with veteran Justin Allgaier. And it gives him a large championship lead of 28-points over Daniel Hemric in second, 34-points over Allgaier in third and 37-points over Ross Chastain in fourth. Bell’s five victories ties him with Greg Biffle (2001), Kyle Busch (2004) and Carl Edwards (2005) for most ever by a series rookie. This Saturday’s Charlotte Motor Speedway Road Course for the Drive for the Cure 200 (at 3 p.m. ET on NBCSN, PRN and SiriusXM NASCAR) presents a unique first-time championship challenge. However this series has raced on more road courses than any of NASCAR’s three premier series. Joey Logano won at Watkins Glen, N.Y. and Allgaier won both at Mid-Ohio and Elkhart Lake, Wisc. In the last 10 years there have been nine first-time series winners in road course events. What to Watch For: The two previous road course winners this season are Martin Truex Jr. (Sonoma, Calif.) and Chase Elliott (Watkins Glen, N.Y.). … Brad Keselowski won the previous race on the Charlotte Motor Speedway oval in May. He has never won a Cup road course race. … Of the previous road course winners competing this weekend, A.J. Allmendinger (2014, Watkins Glen) is the only former winner not in the Playoff field. … Jimmie Johnson is ranked 14th – six points behind the 12th place cutoff entering this week’s Playoff elimination race. Twice before Johnson has won the first elimination race (at Kansas, 2008) and at Dover (2013) and both times he went on to win the Cup championship. … Of the four drivers on the Playoff “bubble” ranked 13th-16th, Erik Jones has the best showing at the season’s two previous road courses. He finished seventh at Sonoma and fifth at Watkins Glen. Clint Bowyer was third at Sonoma and 11th at the Glen. … Harvick boasts the current best driver rating for the season (115.2), followed by Kyle Busch (110.8). Harvick has led a series best 1,274 laps. Busch is next with 1,209. What to Watch For: Regular season champion Justin Allgaier is still tops in driver rating (109.7) and laps led (612) on the season. … Christopher Bell, however, leads the Playoff standings by 28-points over Daniel Hemric and 24 over Allgaier. … Ross Chastain, who won in the Chip Ganassi Racing No. 42 at Las Vegas, returns to the No. 4 JD Motorsports car at Charlotte; he is currently fourth in the standings. His best road course finish this year is seventh at Road America. … Elliott Sadler is fifth in the points standings. He is one of the best on road course venues and although he is looking for his first series victory since 2016, he has reason to believe this week’s venue may be the place he scores that win. He has finishes of 12th (Watkins Glen), sixth (Mid-Ohio) and fifth (Road America) on road courses this season. … Cole Custer, who sits in ninth place in the Playoff standings – one position out of the Playoff cutoff – earned top-10 finishes in all three road course races this season. … Hemric, who is still looking to earn his first ever win in the Xfinity Series, leads all drivers this season in laps run among the top-15 (4,284). Custer is second with 4,278. The two are also tops in percentage running on the lead lap. Custer has 95.4 percent of the time and Hemric has 95.3 percent. …Three road course aces from the IMSA Series will be among the starting grid. Meyer Shank Racing teammates Lawson Aschenbach, Justin Marks and Katherine Legge are entered. This will be the third start of the season for former series race winner Marks and the fourth for Katherine Legge.